A long time ago, at school or at home, I occasionally read a book about the resistance in the Netherlands during the 2nd World War. These books were really interesting. In the internet I started looking for sites on the 2nd World War and from my dad I got the book ‘from D-day till Berlin’ from Stephen E. Ambrose. After seeing some interesting sites and reading the book, I got really interested in the 2nd World War and it forms a major part in my daily life. 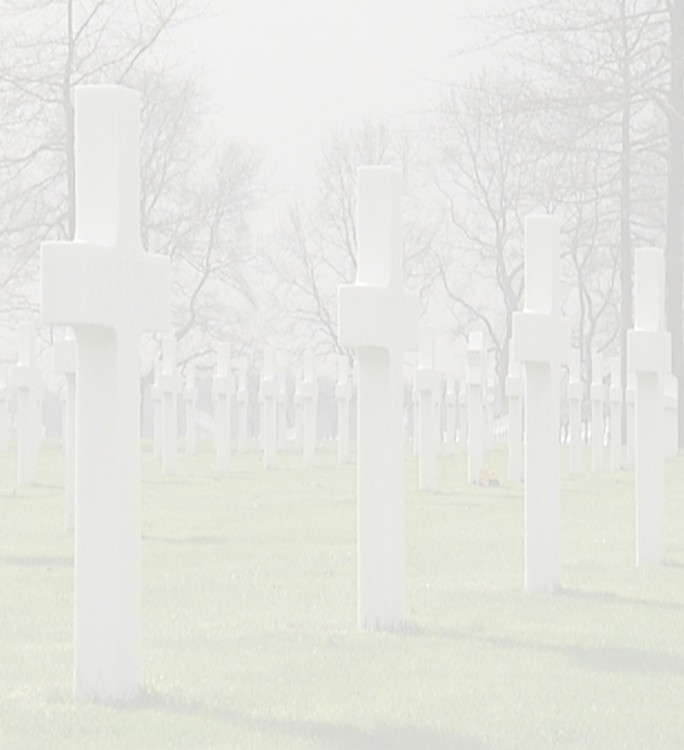 On a site on the 2nd World War I read about the possibility of adopting a grave at the American Cemetery in Margraten. I liked the idea. A couple of days later I enlisted via the website for adopting a grave. It took a couple of months, but in August 2006 I finally received my adoption certificate. 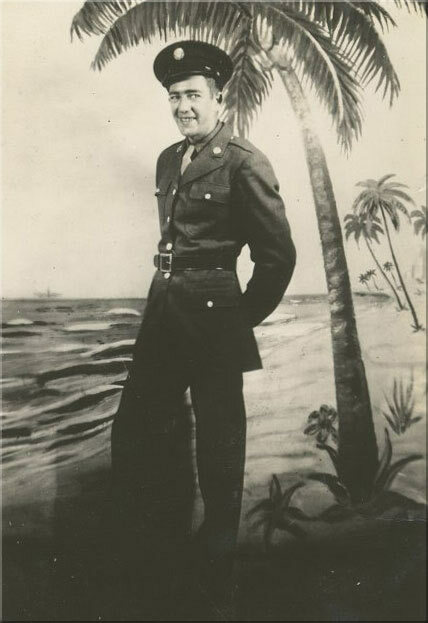 The grave belonged to Lawrence F. Shea, a corporal in the 318th Infantry Regiment of the 80th Infantry Division and he was killed on April 2nd 1945. After receiving the certificate I started looking for information. In the beginning I didn’t find that much. His information at the American Archives were lost in a fire. But I experienced more and more help from people from the States. With their help I found a lot of information about Lawrence F. Shea and his family. I had not expected people in America being that helpful. They are very grateful that you do something like this and are eager to help you finding information on the adoptiongrave. Without their help it would have taken a lot longer to find the info I have now on Lawrence. Therefore I’m really greatful to them. 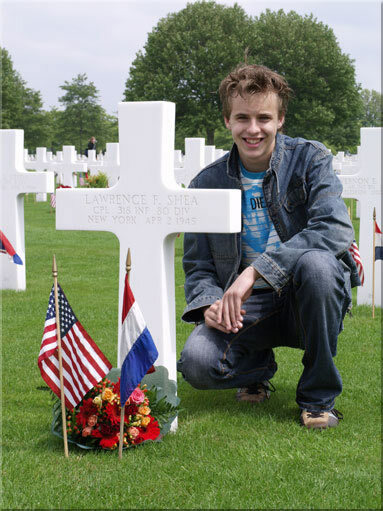 In the fall holidays of 2006 I went to the American cemetery for the first time and to his grave. After driving for 2 hours we, my dad and myself, arrived at Margraten. The weather wasn’t too friendly but I couldn’t care less. After taking a vase with water we walk onto the grounds. I got a weird feeling, seeing all the graves. I had never seen something like that before. Quickly we’d found the grave of Lawrence F. Shea. After placing the flowers at the grave I stayed there for a while. After a few months of investigation I finally stood at his grave. It felt special standing at the grave from the soldier who you’ve adopted. Because I had some names of family members I started a search hoping I would find them. I surfed the internet for names and phonenumbers of people who possible could be family. Some one from the States called, but turned out not to be family. Untill I suddenly received an e-mail: someone had traced a nephew of Lawrence. I can describe how that felt. I reacted straightaway per mail and quickly received an answer. After introducing ourselves he send me information on Lawrence together with some pictures. I know finally knew how he looked like and who’s grave I’ve adopted. I found and still find information. And the search isn’t over yet. I’ve visited his grave more often now and I still receive information. While I still have the idea that the search still hasn’t come to an end. Because I still don’t know anything about some parts of his life. This would be my first Memorial Day so I didn’t know what to expect. Early in the morning we left. First we visited Henri Chapelle where my other adoptiongrave is and where Memorial Day was a day earlier. After bringing flowers there we went to Margraten. We could see on the way upthere, that is was really busy. After parking the car we went to the grounds. How impressive that looked. All the flowers and flags near the graves gave a pretty sight. We walked over to the grave of Lawrence F. Shea and put down the flowers, they already had run out of vases. I took some pictures and had something to eat before taking pictures for FBNF. After that we looked for a place on the stand to join the ceremony. The national anthems were impressive and also the speeches were interesting. From the English speeches I didn’t understand too much because my English is not that good. 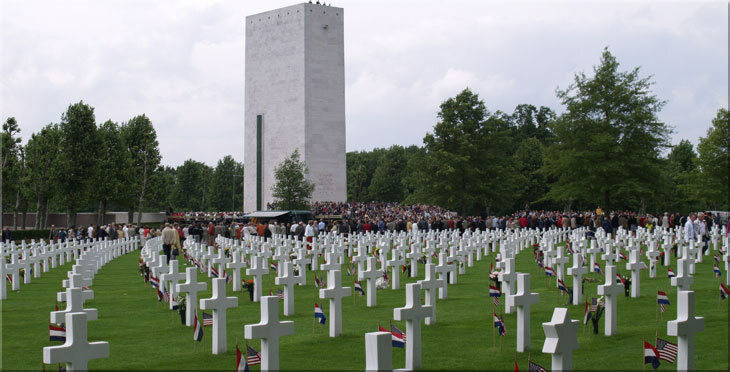 I did regret it that people started on the war in Afghanistan because Margraten is a cemetery for the killed ones from the 2nd World War. I was amazed to see how many wreaths were placed. I was at Henri Chapelle before, there were a lot less. The fly-over was really amazing. A nice honourship for all the ones killed and which are buried in Margraten. The ceremony was in perfect hands of Frank Lahaye, I want to thank him for that.